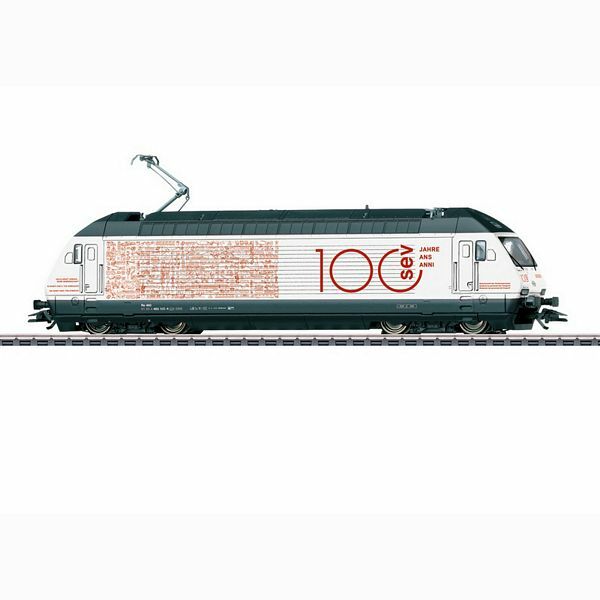 Prototype: Swiss Federal Railways (SBB/CFF/FFS) class Re 460 fast general-purpose locomotive with advertising for the 100th anniversary of the Transportation Union SEV (Bern, Switzerland). Road number 460 113-4. The locomotive looks as it currently does in 2019. Model: The locomotive has an mfx+ digital decoder and extensive sound functions. It also has controlled high-efficiency propulsion, centrally mounted. 4 axles powered. Traction tires. The triple headlights and a white marker light (Swiss headlight / marker light code) change over with the direction of travel, will work in conventional operation, and can be controlled digitally. Additional separately controlled light functions: switching to a red marker light, long-distance headlights, switching to dual red marker lights, switching lights, switching to warning lights, and run authorization lights. The headlights at Locomotive Ends 2 and 1 can be turned off separately in digital operation. The cab lighting can be controlled digitally Maintenance-free warm white and red LEDs are used for the lighting. The locomotive has separately applied metal grab irons. The cabs have interior details. Length over the buffers 21.3 cm / 8-3/8". This model can be found in a DC version in the Trix H0 assortment under item number 22412.